SINGAPORE - The upcoming Jurong Lake Gardens will have a community gardening area, cycling tracks and retain existing heritage structures such as pagodas and bridges. These features of the gardens were among the feedback received during public consultation sessions earlier this year, said the National Parks Board (NParks) on Sunday morning (Oct 25). Some 17,700 suggestions were received during public engagements held from April to May, such as focus groups, townhall sessions and online surveys. The 90ha national gardens, about the size of 144 football fields, will comprise Jurong Lake Gardens West (previously Jurong Lake Park), Jurong Lake Gardens Central (consisting the Chinese and Japanese Gardens) and Jurong Lake Gardens East (consisting grounds of the new Science Centre). Other feedback that will be implemented at the gardens include the preserving of biodiversity hotspots, the planting of seasonal flowering trees and the provision of play and fitness areas. 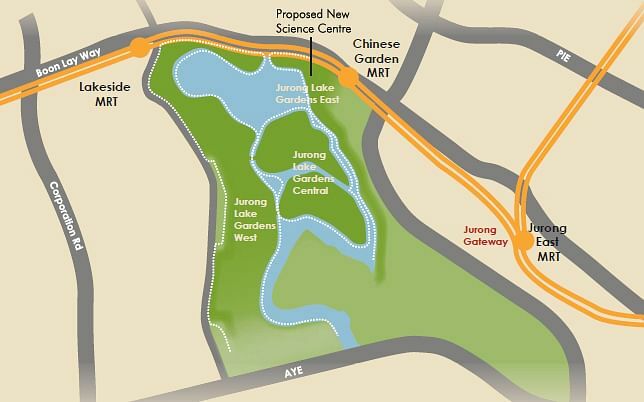 Parts of Jurong Lake Gardens West will remain open to the public throughout its construction, and special pathways will allow the public to continue accessing the Chinese and Japanese Gardens before development works there begin. Construction for the gardens' west area will commence next year. This area is expected to be completed by 2018 instead of 2017 as previously announced, so as to incorporate the most recent suggestions, said NParks. The rest of the gardens will be progressively ready from 2020. NParks added that it will be calling a design consultancy tender for the gardens and work the feedback received into the tender brief. Other suggestions received and may be implemented include robotic plants, vertical greenery, wi-fi hotspots and solar phone chargers. Deputy Prime Minister Tharman Shanmugaratnam noted that there was a very strong preference to retain the area's natural ambience, and that the new gardens will have "a lot more nature" such as distinctive trees and a heron island. "This is going to be a people's garden, so it is really great that we got so many views from the public," he said. "It's our third national gardens, it's very important that it reflects what people want, what they like to see, what they like to feel in the gardens." When asked about the delay in the completion of Jurong Lake Gardens West, Mr Tharman said: "There's more work required both in design and ensuring that the residents' views and feedback are taken into account fully." Mr Tharman, who is also MP for Jurong GRC, was speaking at a mass tree planting event at Jurong Lake Park. He was joined by National Development Minister and chairman of the Jurong Lake District steering committee Lawrence Wong and Jurong residents. Childcare teacher Jaslyn Goh, 43, who has lived in Lakeside for more than 10 years, said she hopes the new gardens will have playgrounds for her children and better lighting. "Sometimes the lights here (at Jurong Lake Park) are dim. Hopefully they will be brighter so it'll be safer at night," said the avid jogger. Taman Jurong resident Murugesan Natanaprakasam, 46, welcomed the preservation of nature in the upcoming gardens. Said the father of a six-year-old boy: "More plants are good. It'll be more relaxing when we walk here and I can teach my son about plants and animals."